Randori: What Does Nihon Goshin Aikido Randori Look Like? Because of the variety and intensity of the attacks (including realistic attacks like upper cuts, jabs, roundhouse punches, punching combinations, headlocks, chokes, etc. 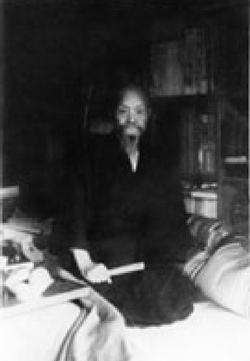 ), Nihon Goshin Aikido randori generally appears a bit rougher around the edges than what you’d see in Ueshiba influenced aikido circles (who limit their attacks to single easily read chops, and basic grabs). I believe Nihon Goshin Aikido Randori presents a realistic picture. In other words, what you see in Nihon Goshin Aikido Randori situations is similar to what you might see in a real world, multiple attacker scenario. 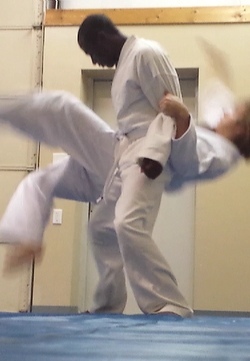 Sensei Muse (L) & Sensei Durand (R) ~ Note the effective use of angles. The first technique ideally always blocks the approach of the other attackers. Occasionally ~ Weird Stuff Happens ~ but always stay martial. Keep circling and you will eventually find something you can work with. Here are a couple of examples from my own shodan test. Nihon Goshin Aikido Randori Film Study. A frame by frame breakdown of the good, bad, and ugly ~ from various multiple attacker scenarios. Here are some examples from my own shodan test.